Paul Coburn Sawtelle was born 20 December 1946 in Memphis, Tennessee. He graduated from The United States Military Academy at West Point class of 1969 and was commissioned a 2LT of Infantry in the Regular Army. He graduated from IOBC and Airborne School at Fort Benning, Georgia. On 18 December 1969 he graduated from Ranger School, Class 6-70. He was assigned to the 82nd Airborne Division at Fort Bragg, North Carolina until being transferred to Vietnam. Upon arrival in Vietnam in August 1970, he was assigned to the 101st Airborne Division where he volunteered for duty with L Co. Rangers. Paul Sawtelle, code name "Gray Hog," distinguished himself on numerous occasions by accompanying Ranger Team patrols deep into enemy territory, flying over head while conducting radio relay for teams on the ground and directing air strikes in support of Ranger Teams in contact. He not only helped plan Ranger Team missions, he also flew with the Ranger Teams on the infiltration aircraft and also on extraction. He acted as the Command and Control for Ranger Teams during live missions. If a Ranger Team got in contact, needed a resupply or emergency extraction, he was there to take care of them. On one occasion, while flying above known enemy territory, Lt Sawtelle spotted two NVA soldiers below who immediately ran into a shallow cave. He unhesitatingly directed the helicopter to land nearby so he could try to capture them. Using CS and smoke grenades he forced both NVA soldiers out of the cave and took them prisoner. With assistance from one of the door gunners, he tied them up and they were taken back for interrogation. On 16 April 1971, Paul Sawtelle led a combat patrol in the infamous Ashau Valley located in Thua Thien Province Northern I Corps, Republic of Vietnam. On the second day of the mission, the Ranger Team engaged a 6 man enemy force by small arms fire and called in Cobra gunships. The Rangers killed the 6 enemy soldiers and later made contact with a larger enemy reaction force. After an extended firefight, the Ranger Patrol was extracted by helicopters and used the Cobra gunships to suppress enemy fire. The Rangers suffered 2 killed and 4 wounded during this mission. 1LT Paul Sawtelle was killed by enemy small arms fire while directing friendly fires of both helicopter gunships and Ranger ground elements. 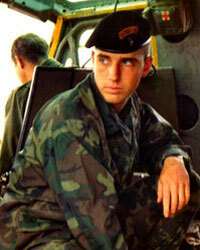 Another Ranger, Sgt James McLaughlin, was also killed during the enemy contact. Paul Sawtelle died while serving his country and while leading a Ranger Team in combat. His selfless leadership and dedication to his men was an example for others to follow. He never once shied away from danger and always positioned himself where he could take decisive action. Paul Sawtelle received a posthumous promotion to Captain. His awards include the Combat Infantryman Badge, Bronze star, Purple heart, Parachutist Badge and the coveted Ranger Tab. PAUL C SAWTELLE's name is on the Vietnam Memorial Wall at Panel 04W Line 129. He was 24 years old when he was killed in action.